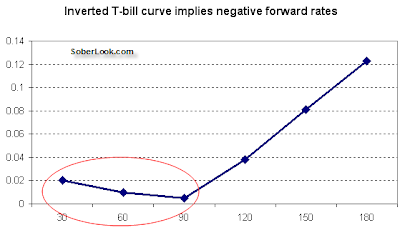 Sober Look: The inverted T-bill curve - an anomaly or a signal for another downturn? The inverted T-bill curve - an anomaly or a signal for another downturn? 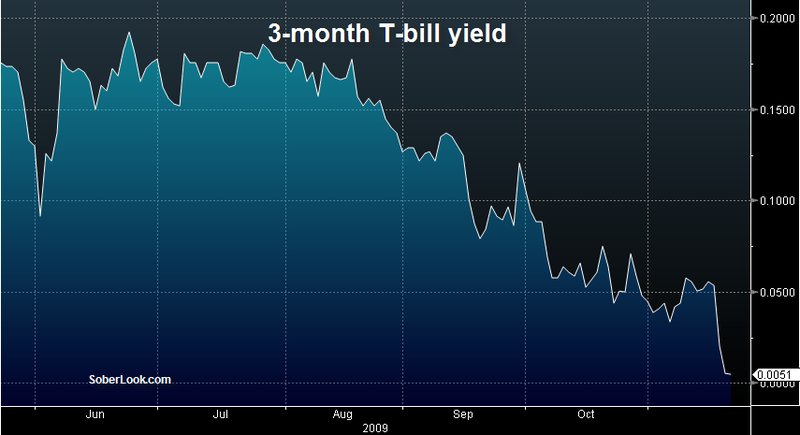 The 3-month T-bill yield has collapsed to new lows, yielding half a basis point. That means if you plow a million dollars into 3-month bills right now, in 3 months you will walk away with your million plus about 13 dollars. After inflation is taken into account, you are down about $3,000 (depending on the assumptions). Why would anybody do this? Trading desks everywhere are told - we are done for the year. We've made out money for the year; let's bring it home. Unwind as much risk as you can before year-end. And all that cash is flowing into T-bills. Except that people don't want the 1-month bill because it will mature before year-end. There is much less liquidity at the 2-month point. That means the 3-month bills are the only game in town for short-term liquid riskless paper, even if the yield is zero (negative real rates). 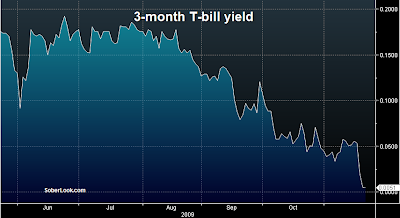 That bid for the 3-month paper has created an inverted T-bill yield curve. It's a strange phenomena because this curve implies negative forward rates (so much for the so-called "arbitrage-free" interest rate models). This means the market sees short term yields going negative before the end of the year (this happened in Japan a few years ago). One way to interpret this is the market is anticipating the economy to get worse before it gets better - possibly weak holiday sales. Another is simply a sudden drop in risk appetite through year-end.